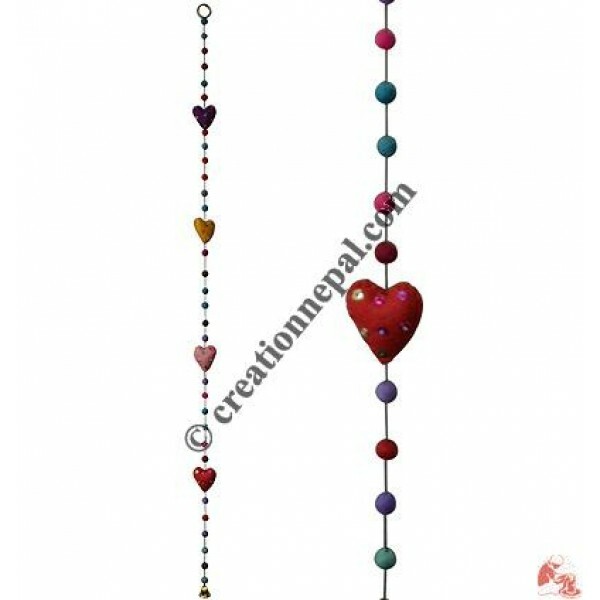 Felted woolen colorful beads and tiny glass beads alongwith twinkling sitara decorated 4-heart shapes decorative hanging with golden color tiny bell at the end. One can hang these in windows or doorways, use as wind charm, decoration of Christmas tree or can hang on the wall to add the colors of the decoration. The actual weight of the item can be less than it is mentioned but the weight for shipping purpose will be calculated in volumetric basis. Since the product is entirely handmade; No two are alike, hence there can be slight variation in given measurement and colors.